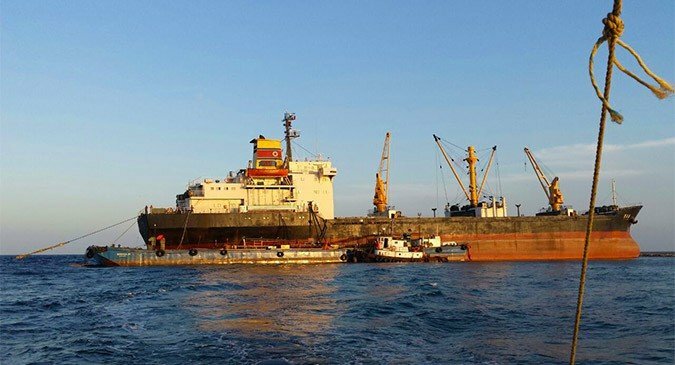 The Mexican government earlier this month classified the North Korean vessel in Tuxpan port as abandoned, and said that it would be sold for scrap. The announcement concludes nearly a two-year limbo for the DPRK registered Mu Du Bong, which was seized after it ran aground on the east Mexican coast in 2014. “We declare the boat called Mu Bu Dong, with DPRK (Democratic People’s Republic of Korea) flag, abandoned, free from any assessment, with all its effects and belongings,” the Mexican Secretariat of Communications and Transportation (SCT) announced last week. The SCT also said the vessel will be transferred to the Mexican government at no cost, on the grounds that the ship now constitutes a risk to itself, port facilities, the environment and other vessels in the area. The ship was the subject of a diplomatic spat between Mexico and North Korea. While originally detained for causing damage to a coral reef when it crashed, the accident was poorly timed. Shortly after Mexico detained the ship, its owner Ocean Maritime Management (OMM) was blacklisted by both the UN Security Council and the U.S. Department of Treasury. The sanctions were a result of the Chon Chong Gang – one of Mu du Bong’s sister ships – weapons smuggling operation through the Panama Canal in 2013. The subsequent investigations from the Panel of Experts (PoE) have linked OMM to the North Korean government’s sanctions busting activities. The Mexican government’s recent announcement represents the first time a sanctioned North Korean ship has been frozen and scrapped. The previous interdiction in the case of the Chong Chon Gang resulted in the vessel’s release, and more recently a vessel frozen by the authorities in the Philippines was set free after the ship was removed from the UN’s blacklist. Russia is currently the most lenient country when it comes to North Korea’s sanctioned vessels. While OMM is currently no longer listed as the owner or operator of any ships in the DPRK’s fleet, a number of its former vessels became regular visitors to ports in the Russian Far East at the end of 2015. “(The) Russian Federation requested additional information from the Panel about some of the vessels’ connections to OMM, stating in a letter of 13 January 2016 that it did not have evidence of the connection,” the most recent PoE report reads. Subscribe to read the remaining 394 words of this article.